While my husband does not share my love of cooking, I take great pleasure in the fact that he does share my love of food. With is combination of enthusiasm and appetite, he is a rewarding audience to cook for - appreciative and just a bit greedy. While I was thrilled at recent gifts of cookbooks and foodie magazines, a part of me does think that my dear Sean was even more excited. After far too many days featuring the customary menus of the season, it was he that flipped through my new books, taking note of any particularly tempting ideas. Feeling a bit burnt out after the aforementioned feasts, I was all too happy to hand over the responsibility of culinary creativity (and the associated shopping trip) to my willing partner. It is a strategy we have been known to employ, one that prevents me from falling into a routine of recipes and challenges me a bit to boot. I will admit to exercising executive privilege now and again, balancing Sean’s often-carnivorous tendencies with lighter fare or substituting ingredients I know are more suited to our tastes. The exercise keeps us both involved in the decision of what we eat, with Sean frequently, and pleasantly, surprising me with his choices. Most recently, it was a recipe by Tyler Florence that piqued interest - fat noodles with buttered artichokes and crab. Looking at the requisite glossy photo presented alongside, the unctuous tangle of pasta and seafood immediately recalled Nigella Lawson's chili crab with linguine. Featured in the book Forever Summer and on the television series of the same name, hers is a recipe I have carried around in my mind for years. I vividly recall salivating over the sauce alone - luscious bits of pink crab meat specked fiery orange with chili. It was one that I have always intended to make, but have never found the occasion. Not wanting to pass up the chance now, I combined the two recipes to best appease my (nagging) curiosity and to meet Sean’s request. The result was a triumph; rich enough to feel a bit special and celebratory, still fresh with bright lemon and peppery ribbons of green. A harmonious beginning to a new year. My interpretation of recipes from Nigella Lawson and Tyler Florence. I had not intended to share this recipe, but after tasting it I decided it was worthy of a feature. My sincere apologies; some of the ingredient quantities are estimates as I did not weigh and measure as I cooked, as I usually do. Put a large pot of well-salted water to boil. Cook the pasta, according to package directions or to taste. As the pasta will continue to cook when you toss it with the warm sauce, I would advise cooking until just under al dente. Meanwhile, in a small food processor or pestle and mortar, crush the garlic, salt and chili flakes into a smooth purée. Set aside. In a large skillet over medium heat, melt the butter and olive oil. When just melted, add about 1/2 cup of the starchy pasta cooking liquid, along with the garlic purée. Continue to cook, stirring, until reduced by about 1/3. When thickened, add the artichokes and gently toss to coat. With the heat on low, add the crab meat, lemon zest and juice and stir to combine. Tip in the cooked, drained pasta, turning so that the noodles are well-slicked with the buttery juices. Add the parsley and arugula, continuing to turn until the greens are slightly wilted. Check for seasoning, garnish with additional chili and fresh greens if desired, serve. Serves 4 as a main course, 6-8 as a light lunch or entrée. The continuation of an exploration of some of my cookbooks, featuring Laura Washburn's Bistro. I must admit I started out with a somewhat prejudiced view of French cuisine. Growing up, I was only really exposed to the stereotypical view of haute cuisine – I’m sure some of you will recall Donna Martin spitting out calves brains on Beverly Hills, 90210. Luckily for me, somewhere along the way I realized that I should not learn my culinary lessons from Aaron Spelling, and I ventured out into the wonderful world of cooking — mainly through my mother’s cookbooks. I was 12, and did not have many opportunities for gastronomic safaris. It was through these books that I began not only to learn names like Auguste Escoffier and Antoine Carême, but also about mother sauces, demi glace and, my greatest discovery, French home and country cooking. It was this food of the hearth, dishes like boeuf bourguignon and terrines, I found most inspiring; featuring deceptively simple flavours and complex results. This fixation continued, bringing about my obession with a good baguette, and my frequent patronage of bistros and brasseries. Give me a good steak frites, and I’m set; a long-simmered shank with a robust reduction, and I do not know how to be closer to heaven. I was in one of these moods when I came across the book Bistro, by Laura Washburn. Hungry and waiting for S in a bookstore (he should know better than to keep me waiting in a place with cookbooks nearby), I was idly leafing through their selection when my eyes fell upon a mouth-watering goat’s cheese tart pictured on the back of a book. Turning it over, I was greeted with a bowl of tempting French onion soup, perfectly presented with a cap of blistered gruyère. The book came home with me that night, and very rarely is far from at hand. Washburn recalls holidays in France from her childhood, with a nostalgic patina of romance and discovery. The book features both classic recipes, from the ideal crème caramel to the venerable cassoulet, and personal creations like a cumin-scented chick pea salad. She encourages substutions when necessary, but never loses sight of traditional preparations. It is this respect for the culinary history, while not putting limits on your experience of the food, which spoke to me of her affection for these flavours; she evidently wants to share these tastes and stories. From Bistro, by Laura Washburn. Salt cod and snails are traditional ingredients in this Provençal dish, but salmon and shrimp are easier to come by for most people. Be sure to use very good oil; despite great quantities of garlic, the flavour base of the aiöli comes from the oil, so it is worth investing in something special. Serve for a crowd, with everything freshly cooked and warmish, or at room temperature. Wash it all down with a chilled white or rosé from Provence. Heat 1 tablespoon of the oil in a large non-stick skillet, add the salmon, and cook for about 3 minutes on each side, or until just cooked through. Season with salt and set aside. Add another 1 tablespoon of the oil to the pan. When hot, add the shrimp and cook until pink and firm, 3-5 minutes. Do not overcook or they will be tough. Season and set aside. Put the potatoes in a saucepan with cold water to cover and bring to a boil. When the water boils, add slat and cook until tender, 15-20 minutes. Drain and set aside. Meanwhile, cook the asparagus tips and beans in boiling salted water until just tender, about 3 minutes. Bring a saucepan of water to a boil with the bay leaf. When it boils, add the carrots and cook until al dente, 3-4 minutes. Remove with a slotted spoon and set aside. Return the water to a boil, add the cauliflower florets, and cook until just tender, about 5 minutes. Remove with a slotted spoon. Return the water to a boil, add the broccoli, and cook until just tender, 3-4 minutes. Rub the zucchini all over with the remaining oil. Heat a ridged stovetop grill pan. When hot, add the zucchini pieces and cook, about 4 minutes per side. Alternatively, cook the same way in a non-stick skillet. Remove and season. Put the eggs in a saucepan with cold water to cover. Bring to a boil and cook for 6 minutes from boiling point. Drain, cool under running water, then peel and slice. To make the aiöli, put the egg yolks in a small, deep bowl. Beat well, and then gradually beat in the oil, adding it bit by bit and beating vigorously, until the mixture is as thick as mayonnaise. Stir in the garlic and season to taste. Arrange all the vegetables and fish on a single platter, or on several platters. Serve, passing the aiöli separately. • While I love this dish in its full-blown glory on the weekends, for the weeknight it is not always the most sensible. For the photograph above, I prepared my fallback version; potatoes, salmon, asparagus and beans, all oven-roasted and served with the aioli. • For those adverse to using raw egg yolks, there are pasteurized egg products on the market which can be substituted. Check the packaging for how much to use to replace each yolk, as producers may vary. I’m sure this might not seem odd to some of you — those who live in colder climes, those who seek out such weather, or those who live on top of a really tall, and perpetually snow capped, mountain. But to me, in Southern Ontario, where daffodils are proudly lifting their golden heads and blossoms are blooming, hail was not what I expected on the second day of May. I should probably explain something. I don’t like cold. Yes, I know, Canada. I have no problem with winter, per se; I love having my hands wrapped around a mug of hot chocolate, I cannot get enough of the smell of evergreen and I wish I could capture the magic of the world under a blanket of snow. Furthermore, let me tell you, I am nothing short of adorable in a snappy parka and mitts combo. But, I hate the state of being cold. Yesterday was a crisp and gorgeous day, with blue skies and that amazing smell of damp soil, all herbaceous and green. It was like the landscape was about to burst. But instead, the skies did. Not a little hail, but a veritable avalanche of hail (I may be exaggerating a bit). Either way, it was pinging off sidewalks, pinging off of windows and pinging off my not-at-all-suitable-for-this-sort-of-freak-weather spring jacket. By the time I got home, my hair was matted and wet, my teeth were chattering and I was not amused in the least. And, I was cold. After some general pouting about the unfairness of it all, I found solace at the bottom of a bowl of miso soup and some green tea. The world started to slowly become right again. Today has brought lower than seasonal temperatures, overcast skies and a 40% chance of rain. And yet, I’m somehow rejuvenated. The daffodils are still outside my window, market stalls are starting to fill with local produce, and spring doesn’t seem too far away. There must have been something magical in that miso. I’m completely prepared to wait. But that won’t stop me from conjuring the season with food. 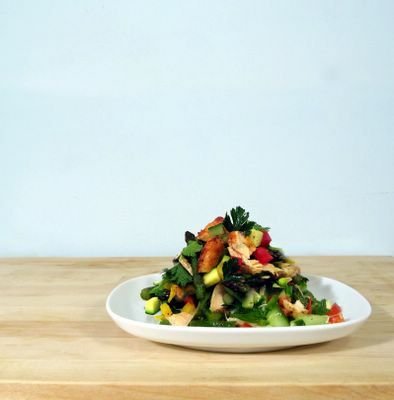 This salad simply tastes like spring. With bright and clear flavours, you can’t help but be happy when you eat it. Ever since delectableposts on the topic of asparagus started popping up with the crocuses, I have been nothing short of obsessed with roasting it. 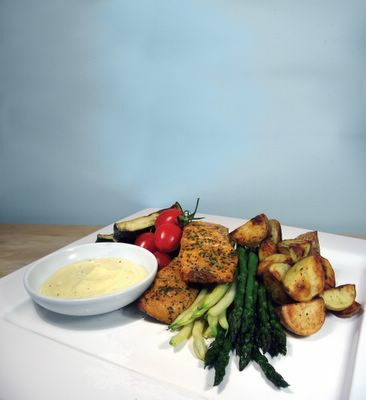 This recipe makes use of leftovers from a staple meal in our house: roasted potatoes, salmon and asparagus, with variations on aioli. I have now taken to purposely making too much salmon and asparagus, just to guarantee tomorrow’s lunch. Combine all salad ingredients, except salmon, in bowl. In a separate bowl, whisk together rice wine vinegar, mustard, salt, pepper, shallot and lemon zest. Drizzle in oil, whisking constantly. Pour as much vinaigrette as you’d like over the salad, tossing to coat. Flake the salmon filet, add to salad and gently combine. If you toss too enthusiastically the salmon will continue to flake — I like to add the salmon last, so that I can preserve larger pieces. • Omit capers and salmon from above recipe. Add one can of chickpeas and a 1/2 cup of crumbled feta to the salad instead. For the vinaigrette, replace the rice wine vinegar with red wine vinegar, and add 1 teaspoon minced garlic, 1/2 teaspoon oregano and a 1/3 teaspoon of ground cumin. 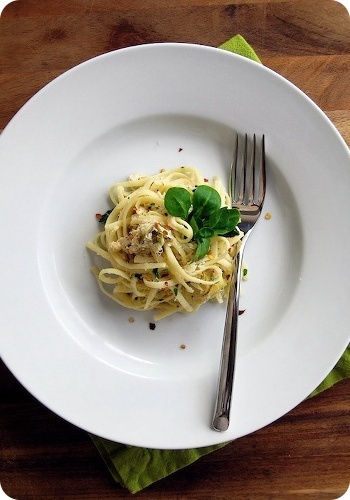 • Omit capers and sundried tomatoes from above recipe. For the herbs use only cilantro and add in one finely sliced red chili. Replace the vinaigrette with one made with 2 tablespoons lime juice, 2 tablespoons vegetable oil, a few drops of toasted sesame oil, 2 teaspoons fish sauce, 2 teaspoons hoisin sauce and 2 teaspoons Chinese chili-garlic sauce. Just before serving, sprinkle a tablespoon of toasted sesame seeds over entire salad.